Who's Coming to The International Business Awards This Friday? More than 280 executives from over 30 nations will gather at the Ritz-Carlton Hotel in Toronto, Canada this coming Friday evening, October 23 for the presentation of The 12th Annual International Business Awards, the world's premier business awards program. Gold, Silver and Bronze Stevie Award® winners, selected from more than 3,700 nominations received from organizations and individuals in more than 60 nations, were announced on August 13. All organizations worldwide are eligible to compete in The International Business Awards, and can submit entries in a wide range of categories, including management awards, new product awards, marketing awards, PR awards, customer service awards, website awards, and more. 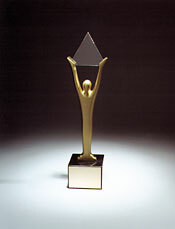 Winners of People's Choice Stevie Awards for Favorite Companies, as voted by the general public, and Grand Stevie Award trophies, as determined by the total number of Gold, Silver and Bronze Stevies won in the IBAs, were also announced earlier and will be presented in Toronto this Friday. Here is the list of 2015 Stevie-winning organizations that will be represented in Toronto this Friday. Photos and videos of the awards presentations will be available next week. Entries for The 2016 International Business Awards will open in January. Join the mailing list and you'll be emailed the 2016 entry kit as soon as it's available.